It’s a wonderful jacket to throw over your solid colored t-shirt or turtleneck and you are dressed to go. With this design I tried to do something different than the traditional placement of Fair Isle colorwork and used it for a wide collar and cuffs to steal the show of an otherwise slick, slightly shaped and classic cardigan. I absolutely LOVE how the Fair Isle collar turned out after incorporating 2 invisible shaping rows that don’t interrupt the Fair Isle pattern and give the collar extra fabric to nicely curve around your back neck. The bottom hem, collar and cuffs all have a “mouse tooth” edging and folded over lining for a clean finish. 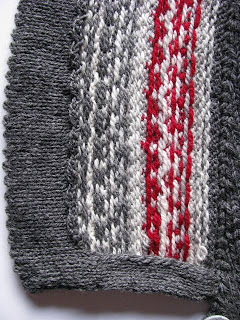 And the front button bands are knitted in together with the body. The cardigan body is worked in one piece, from the bottom up to the armholes, then split into fronts and back. 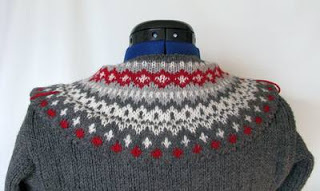 The collar is knitted on and worked back and forth. The sleeves are worked flat from the shoulder down, then joined to work the cuffs in the round. 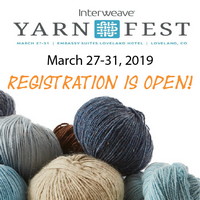 I have to admit that this was the first time that I’ve worked with Cascade Yarns Cascade 220 and Cascade 220 Sport and I’ve enjoyed it quite a bit. It held up really well to my many unraveling sessions until I got the shaping and collar increases just right. It’s definitely a great fit for an outer layer like a cardigan and the colors are nice and rich. I will have to come up with a couple more designs of this very pleasant to knit with yarn. Hope you will enjoy not only this pattern in the new Knitter’s Magazine but also all the other inovative cardigans in this issue.